19 Crimes comes from Bailey's of Glenrowan, an old winery established in Australia in 1870, although this is certainly a much newer brand. The 2012 vintage 19 Crimes Red Wine is a Shiraz-Durif blend. It pours a dark, deep maroon color. It has aromas of cranberries, black raspberries, and hints of lovely holiday spices. Tasting bring a thinner mouthfeel than I was expecting with mild notes of craisins, pomegranate, vague vanilla and nondescript spices, and ripe raspberries finishing it up, with very little in the way of tannins or oak, though enough to keep it from being flat and lifeless. It is surprisingly mild and easy-going without going very far in any one direction. Overall, an easygoing everyday type of wine... with a cool label. Drink This: if you're looking for a nothing special, easy-drinking red wine that has a great looking label that also serves as a conversation starter. Don't Drink This: if you want a red that's a little more burly. 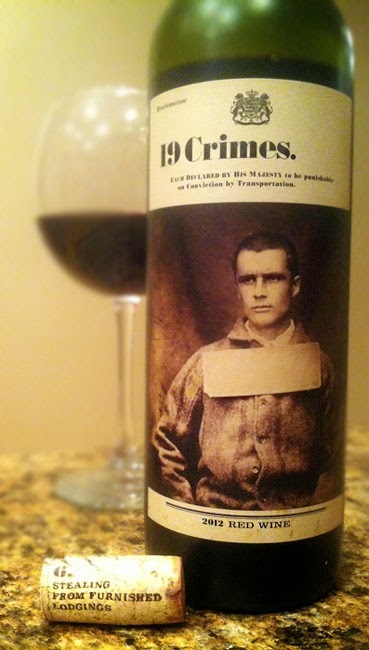 I guess the label on the 19 Crimes Red Wine set me up with expectations of it being a little bigger in flavor. Oh well... still not bad.